An investigation is under way after a suspected gas explosion caused “significant damage” to a block of flats, injuring three people. 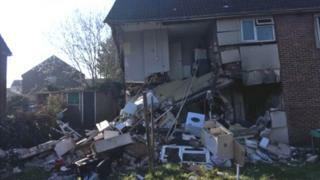 Neighbours were evacuated after the blast at 19:50 GMT on Saturday in Whitchurch Lane in Hartcliffe, Bristol. One witness heard a “humongous bang” before her partner rescued a man on fire from one of the properties. The flats are cordoned off while structural damage is assessed and the road is closed. 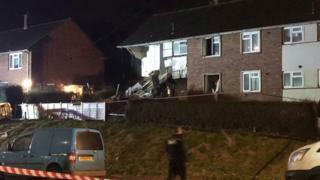 Avon Fire and Rescue’s Vaughan Jenkins said it “appeared to be a gas explosion” which caused “significant damage to two end flats of a block of four”. He confirmed three casualties were given first aid at the scene before being taken to hospital by ambulance. The woman whose partner helped with the rescue mission said the injured man was her neighbour. She said he was doused with water to put out the flames and that another woman escaped from the flat unharmed. 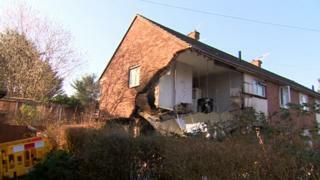 The witnesses, who wanted to remain anonymous, said “the whole house just fell in”. Avon and Somerset Police and Bristol City Council returned to the site earlier to ensure it remains safe. The authority said: “Once investigations are complete and a structural assessment has taken place we will confirm if the property needs to be demolished.